Only 8 Days Away From “Comedy For A Cause ” Event Featuring Mike Tyson and Russell Peters! 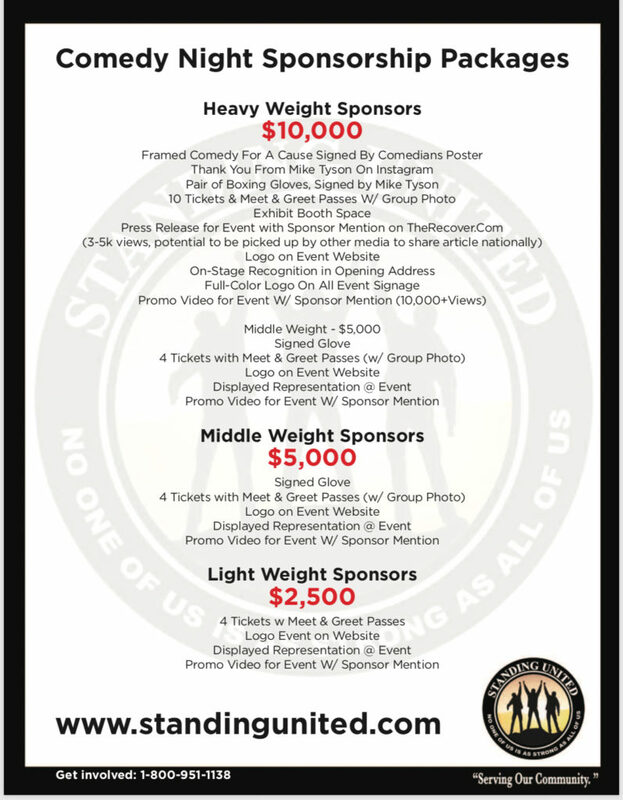 Standing United Is just days away from presenting the first annual “Comedy For A Cause ” featuring Mike Tyson, Russel Peters and many more in hopes of battling addiction. 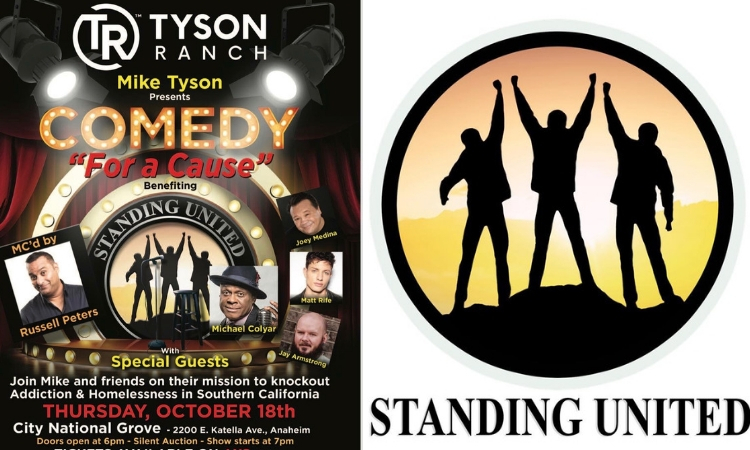 In just eight days comedians will take the stage at the City National Grove of Anaheim, working with Tyson Ranch and Standing United, together creating this event in hopes of raising not only money but the awareness in order to continue their fight in helping millions of broken people fix their lives. “Standing United is a non-profit 501 (c)(3) that gives much-needed assistance to people struggling with addiction and homelessness. Born out of the gut-wrenching experience of watching our own loved ones struggle with and often times lose the deadly battle with addiction. Most of us never thought it would happen to anyone we knew, but when it did we were completely unprepared. After seeing so many overcome by the deadly grip of addiction, stripping the life out of family and friends, until many end up dead or on the streets. Many who want to reach out don’t know where to turn. In fact, there is such a negative stigma associated with drug addiction that many don’t even talk about it. That’s why STANDING UNITED is doing just that. It’s time to bring drug addiction out of the shadows of shame and secrecy. It’s time to shine the light on this terrible epidemic and take a stand for those who can’t stand on their own. With your support, we are able to extend our reach to those suffering from this terrible epidemic. We help people reintegrate into society and become productive citizens. We’re relentless in our commitment to restoring lives and families. So many are in need, please stand with us and make a difference today. Do not wait! Join Standing United and Tyson Ranch on this day of happiness and recovery. We all hope this event will bring light to an issue that creates such darkness in so many peoples lives. Follow www.therecover.com for updates on the event.